This may surprise you but I have feelings about the marathon I just ran. Mostly joyous (marathon number ten! woo!) and some conflicted (thwarted by poopy weather again! boo!) I do like to get lots of words out after running these things though so here it goes. Marathon running is hard. EVERY time. No matter how fast or slow. It's effing hard. (I know, I know. That's what she said.) But in all honestly, how can something be so humbling and inspiring and infuriating and uplifting all at the same time? 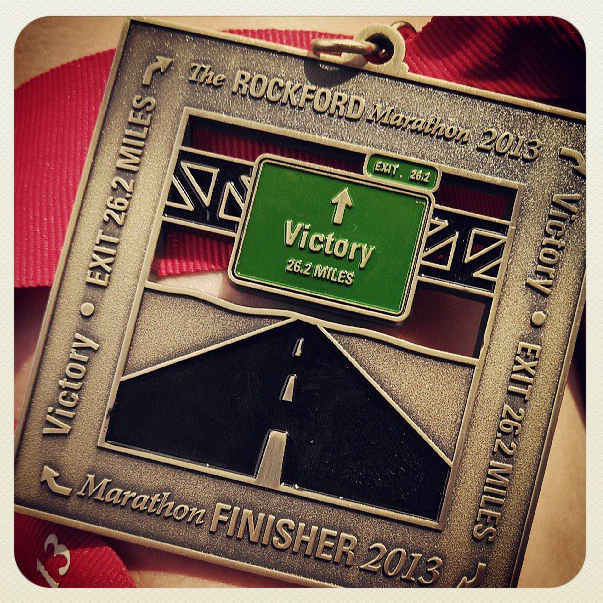 This is the second year in a row I came to the starting line in Rockford PREPARED. I do my speedwork, I do my tempo runs, I cross train like a beast, I eat my vegetables, blah blah blah. I ran an "easy" 1:52 half a couple of weeks ago and felt amazing- not to mention the 1:44 I ran in the fall! I feel like I'm on top of my game running-wise right now. And yet... marathon smacks me in the face yet again. The first half of this race was spot on. With the exception of a too-fast first mile I was averaging an 8:45-8:50 pace and felt like I was just out for an easy run the whole time. I hit 13.1 in 1:56- EXACTLY my race strategy- but something began to change in hour three of the race. Sun. Sunsunsunsun. Stupid sun. It crept up slowly, as in I didn't feel like I was slowing down but I started to see the pace on my Garmin inch down with every mile. 8:58, 9:03, 9:12. What. I passed mile 16 (where I had to start walking last year) and I noticed a lot of other runners were looking like they were in bad shape. I started to get that feeling where you just know that something isn't meant to happen. I was hanging in there because I wasn't ready to "let it go" but in my heart I just knew. I'm not sure exactly when I started taking walk breaks. Mile 18? Somewhere around there. The second half of this race has a lot of slow climbing hills and with the temperature rising and my pace slowing this is what ran through my mind: I was already off pace for my 3:56 PR. Honestly I was pretty much off pace for even a sub-4. I had no "C" goal so I needed to decide what was important to me at this point. But then something happened. Around mile 22 we wound our way through a shaded bike path. Some clouds started to roll in and although at this point I wasn't going to be able to start running sub-9s again, I started to feel *better* overall. I started passing people who were walking again. I started smiling. When I finally turned the last corner before finish line I had a big stupid grin on my face because HOW COOL is this? The last .2 is all downhill across long bridge and it's one of my favorite things ever- this small little race in this weird little city that I'm from and I love it so much. I remember doing a little mini leap thing at one point and being really grateful that I didn't fall on my face. I saw my aunt and uncle waving like crazy and and I waved back like a goofball. It's amazing how quickly all the frustration and and pain gets washed away in those last seconds. I ran a 4:13. I realize that is a time that a lot of people would absolutely love to run. 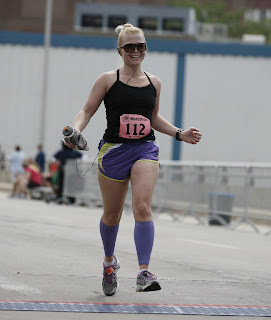 I ran a 4:13 (hey, with a lot of walking even) and it was my TENTH marathon in less than four years! That's beyond anything I ever thought I would do when I first stepped on a treadmill. And I'm going to run a 3:55 someday. In fact, I'm going to run a 3:50 someday. Yeah, I said it. I'll keep trying. I'm patient.